This post is primarily promotional I just want to say up front. I am making a new category on my blog for any future promotional posts so if you are a subscriber and don’t want to receive any of these kinds of posts, you can simply go to your subscription settings and take this category off of your email notifications. I don’t plan on using this category a lot, probably a couple times per year to let people know about new services at Minam or if I do another rod give away or something along those lines. Now back to the subject of the title: Guided fly fishing trips for steelhead on the Grande Ronde River. This fall I am once again guiding for steelhead on the Grande Ronde River between our place at Minam and Troy. Powwatka bridge is our preferred takeout to be more specific. What really makes this section of the Grande Ronde special is its lack of roads, great water, fantastic scenery, and ponderosa pine filled campsites. Starting at Minam we float and fish for 10 miles on the Wallowa River which has no roads. At Rondowa, the Wallowa River joins the Grande Ronde River for an additional 29 miles of river without a road. About the only way to get there is by boat and not many people do it in the fall for steelhead. There are many businesses offering guided fly fishing trips on the Grande Ronde River. Now most of those are on the lower sections which are easily accessed by road and receive a lot of fishing pressure. Some of those guide services on the Grande Ronde are for our roadless stretch. So why should someone consider going on a guided trip with me on this upper roadless section? First, the upper Grande Ronde is my home now. Many guides come to the Grande Ronde for a month out of the year and then leave again. We live, fish, float, and guide on the upper Grande Ronde year round which gives us unique knowledge of the river with an intimate understanding of its water and fish. What we offer is good people to take you down the river that know it well, excellent equipment for you to use on the river and at camp, excellent food, and unsurpassed scenery on the least pressured waters of the Grande Ronde River. Additional information including trip dates and cost are found on the Grande Ronde Guided Trips page of our website. 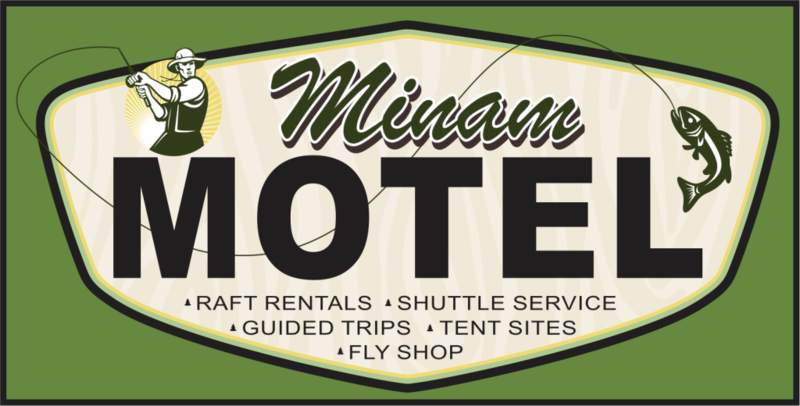 After looking at the dates and cost on our website, send me an email to grant@minamraftrentals.com or give me a call on my cell phone (509-301-6422) to discuss a trip further. Now for some good news about this years steelhead run. Although I have been watching the overall steelhead returns over the dams for the past month, I have had no way of telling how many of those would be returning to the Grande Ronde system. That is until now . . . Jeff Yanke, Wallowa District Fish Biologist, sent me the August 30th PIT tag report showing how many eastern Oregon fish have returned so far. The good news is that the return is already better than last years run. Last years somewhat disappointing run was 10,872 fish for the entire year. We are already to 11,585 steelhead as of September 1st and they estimate the run to be 50-75% complete (over Bonneville Dam). What that means is that at the high end we could get 23,170 steehead to eastern Oregon making for a absolutely fantastic run blowing the excellent numbers out of the water from the 2010-2011 run or we get somewhere around 15,500 steelhead back which is a very good return and 1 1/2 times as many fish as last years returns. Either way it is shaping up to be a good steelhead season. Besides the good news about the steelhead numbers, we have had summer rain this year! And a pretty good rain this past week that muddied our waters for several days. What this means for the steelhead season is that steelhead should move up the river in a timely fashion this year providing a good early season unlike last year where we had no rain from July through most of October and the already smaller steelhead run waited later to grace us with their presence. So to recap: we have good news on the steelhead numbers end and good news on the rain end which could combine to make a very good steelhead season this fall.